Hi everyone I thought I would pop in to share this quick Fall card with you I have used Popcorn bear kids cd rom and believe me when I say it took ages cutting around all those leaves lol i think a few loose ones didn't make it on the card lol but Sshhhhh no one need ever know the paper is also from the cd,i have used a martha stewart punch and card candy,glitter glue and ribbon to finish. Thankyou for visiting me I have another 2 cards to share with you tomorrow they are still drying but i can tell you its back to stamping for those. Lorraine...this is so lovely and good on you for sticking it out and cutting around all those little leaves. Great brads too. Thanks for joining us at Unstampabelles this month. Really cute, Lorraine. Thanks for joining us at Rainbow Lady. Wow, your card is gorgeous!! And I just loooove all those leaves! Can't believe you cut them all out!! Now that's dedication! So sweet Lorraine, love all the leaves. Thanks for taking part in this weeks CES Challenge! 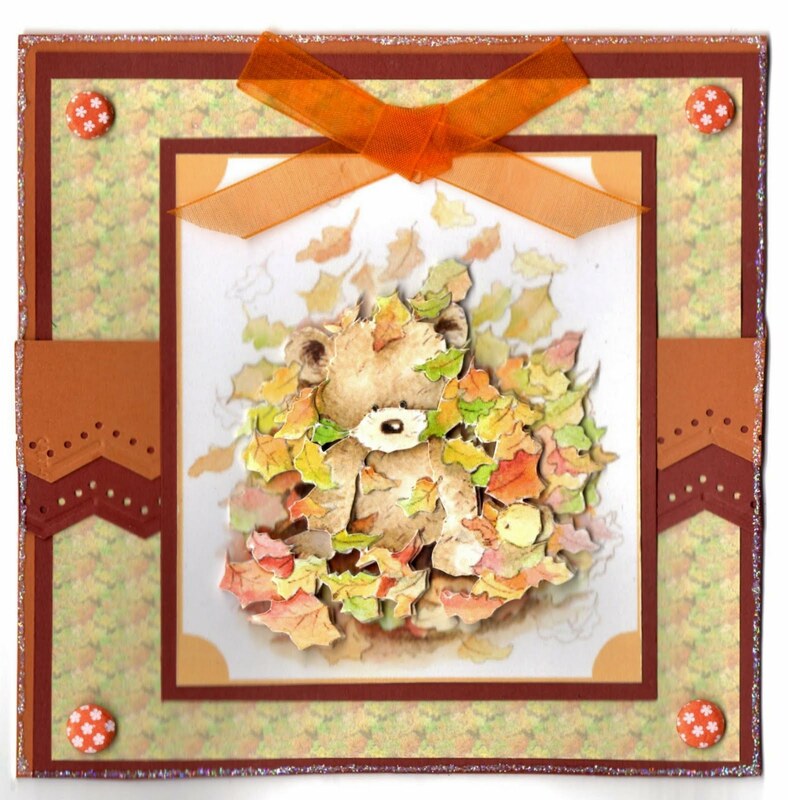 Oh my word Lorraine this is so cute and totally adorable loving that image and the design of this so much, you have captured the Autumnal look perfectly. Super colours & I love that Card Candi you used. The mounting of your image is very effective too with those inverted rounded corners. All that cutting! Bless your heart! Beautiful card and worth all the trouble!